Celtic Ireland, Irish Keychains, Celtic Jewelry, Wallets, Irish Gifts, Travel Mugs, Luggage Tags, Shot Glasses, Images of Ireland and Irish Dancer items. 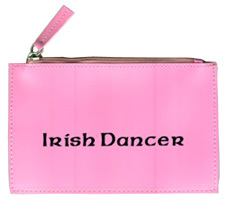 Irish Dancer Pencil Case. Material:PVC. Irish Dancer Luggage Tag. Material: Top Grain Leather. We created our Irish Dancer products by attending many Feis, studying the history of Ireland, and its traditional music. We support Gaelic heritage and its language.